McDonald's has been serving up a ton of deals through its app lately. You can get free fries on Fridays (get it?) and $1 sandwiches daily through the end of the year. But it'd be so much easier if you simply never had to worry about any kind of monetary exchange at all, right? Well, it's now possible to remove money from the equation because it turns out the fabled McGold Card is real, and you have the chance to get your hands on one. If you haven't heard of the McGold Card, it's pretty damn special. It grants the holder free McDonald's for life. All the Big Macs can be yours. However, the details are hazy as to who has been getting these cards. 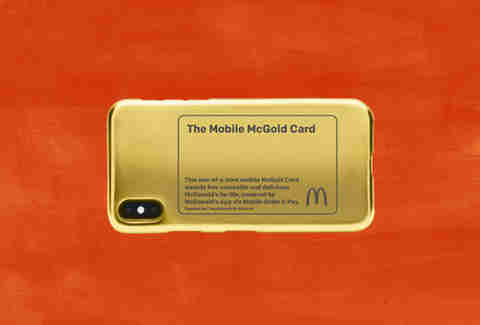 "The McGold Card dates back to 1965, when a McDonald's owner/operators awarded one of its most loyal customers with free McDonald's for life, which became the McGold Card," a spokesperson told Thrillist. "It's a very elusive and secret society. Only a handful of the most dedicated McDonald's fans have been granted McGold Card access." Rob Lowe, George Romney, and Warren Buffet are part of that "secret society." But now, you can actually join those elite -- albeit random -- ranks because McDonald's is giving one gold card away. All you have to do is download the McDonald's app and place an order with the "mobile order and pay" option between August 10 and August 24. Every time you place an order that way, you'll be entered to win with a limit of one entry per day. It's the first time the company has ever randomly given out one of the extremely rare cards. If you win, you'll get "a brand new first-and-only-of-its-kind" mobile McGold Card. It's a 24-carat gold-plated phone case for Android or iPhone. Oh, and the card will have your name etched into it. What's the point of a gold-plated phone case if you aren't going to get your name etched into it?